How to Innovate and Execute Leaders already know that innovation calls for a different set of activities, skills, methods, metrics, mind-sets, and leadership approaches. And it is well understood that creating a new business and optimizing an already existing one are two fundamentally different management challenges. The real problem for leaders is doing both, simultaneously. How do you meet the performance requirements of the existing business--one that is still thriving--while dramatically reinventing it? How do you envision a change in your current business model before a crisis forces you to abandon it? Innovation guru Vijay Govindarajan expands the leader's innovation tool kit with a simple and proven method for allocating the organization's energy, time, and resources--in balanced measure--across what he calls "the three boxes": * Box 1: The present--Manage the core business at peak profitability * Box 2: The past--Abandon ideas, practices, and attitudes that could inhibit innovation * Box 3: The future--Convert breakthrough ideas into new products and businesses The three-box framework makes leading innovation easier because it gives leaders a simple vocabulary and set of tools for managing and measuring these different sets of behaviors and activities across all levels of the organization. Supported with rich company examples--GE, Mahindra & Mahindra, Hasbro, IBM, United Rentals, and Tata Consultancy Services--and testimonies of leaders who have successfully used this framework, this book solves once and for all the practical dilemma of how to align an organization on the critical but competing demands of innovation. "His book is both challenging and easy to understand, offering numerous examples--from IBM to GE to Hasbro--of companies that have made it work." -- SUCCESS Magazine "The book [The Three Box Solution] is clearly presented, with illuminating case studies from a variety of organizations helping to explain the ideas." -- The Globe and Mail "The Three Box Solution is an insightful and thoughtful work that should be on the must-read list for all CEOs--and everyone involved in leading innovation in any kind of enterprise." -- Research-Technology Management "The era of doing things in the same way decade after decade is over. Organisations are confronted by external change and the urgent need to change themselves. 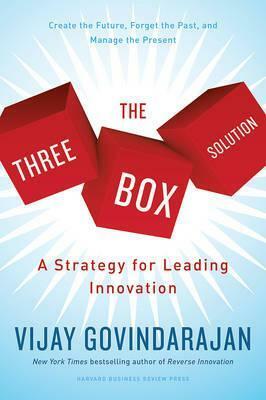 Innovation is nothing less than a matter of corporate survival...By creating three boxes that a company ought to concentrate on when it is trying to pilot its way into the future, Prof Govindarajan may enable its leaders and workers to think outside the box their normal experience traps them in." -- Peter Day, BBC "A powerful new framework." -- Developing Leaders "The Three Box Solution is a clear winner..." -- BW Businessworld (India) "He succinctly outlines the key behaviors that I believe every business leader must focus on, to drive innovation without waiting for the next competitive crisis...the approach actually works and applies to leaders at all levels." -- Forbes "Supported with rich examples--GE, Mahindra & Mahindra, Hasbro, IBM and Tata Consultancy Services--and testimonies of leaders who have successfully used this framework, The Three Box Solution solves the dilemma of how to align an organisation on the critical but competing demands of innovation." -- The Financial Express, India "When we read The Three Box Solution and hear VG describe the experiences from leaders of Hasbro, Tata, IBM, United Rentals, Mahindra & Mahindra amongst others, we get inspired to find our own balance between these three innovation areas: preservation, destruction and creation...The Three Box Solution helps leaders come into harmony with an ageless rhythm, that creates sustainable prosperity." -- Innovation Management (innovationmanagement.se) "With case studies from toy manufacturer Hasbro, coffee maker Keurig, TCS and even a church reinventing itself, The Three Box Solution makes a good breezy read." -- The Times of India ADVANCE PRAISE for The Three-Box Solution: Jeffrey R. Immelt, Chairman and CEO, General Electric Company-- "Simple, powerful, and purposeful." Zhang Ruimin, Founder, Chairman, and CEO, Haier Group-- "The Three-Box Solution presents a simple, yet powerful framework to simultaneously optimize continuous process improvement and breakthrough innovation. Inspiring for management executives." Anand G. Mahindra, Chairman and Managing Director, Mahindra Group-- "Govindarajan's Three-Box Solution provides a framework for balancing the imperatives of the present with the demands of the future. It is a construct that permeates all our strategic thinking." Marshall Goldsmith, New York Times and Wall Street Journal bestselling author, Triggers-- "If your company needs to stop doing what it's done and branch out in new and profitable ways, this is the book for you." Omar Ishrak, Chairman and CEO, Medtronic-- "The Three-Box Solution is a superb guidance manual for anyone formulating and driving a long-term company strategy. An excellent resource for managers and leaders at all levels." Ajay Banga, President and CEO, MasterCard Inc.-- "Govindarajan provides a winning combination of strategic insights and actionable steps designed to help virtually any business or organization build a better future." Indra K. Nooyi, Chairman and CEO, PepsiCo, Inc.-- "At PepsiCo, we practice what Govindarajan preaches." Samuel R. Allen, Chairman and CEO, Deere & Company-- "This book is worth reading more than once; I highly recommend it." Bhaskar Bhat, CEO, Titan Watch-- "It is very refreshing to read The Three-Box Solution because of both its relevance and its simplicity. As you read the book, you connect with events in your own journey as you grapple simultaneously with ideas such as learning from the past, living in the present, and dreaming about the future. The simplicity of Govindarajan's model, like all great ideas, triggers you to think, 'Hey, why did I not think about it this way?' I recommend this book and its approach to both current and aspiring CEOs. Business schools will also find this approach worthy of teaching, and chief strategy officers will find it most useful." Giovanni Caforio, CEO, Bristol-Myers Squibb-- "The Three-Box Solution brilliantly tackles the challenges of a successful company to continually drive the linear innovation essential for today's operational excellence, while nurturing the nonlinear innovation necessary to create the company's future. Marc Casper, President and CEO, Thermo Fisher Scientific Inc.-- "The Three-Box Solution is essential reading for any senior executive leading a successful company with a proud history. Govindarajan gives a clear path for how to create the environment and culture within a company to foster innovation that will make a difference in ensuring a bright future for an organization. Ian Cook, Chairman, President, and CEO, Colgate-Palmolive Company-- "In The Three-Box Solution, Govindarajan offers a compelling framework for driving innovation while delivering current goals, without the constraints of past successes and failures. With powerful, international examples, he offers a clear guide to creating the sustainable, innovation culture needed to stay ahead." Alexander M. Cutler, Chairman and CEO, Eaton Corporation-- "What a compelling piece of work--and its genius is in its simplicity. Leaders at all levels of the organization should find the three-box model for innovation a how-to manual for success." Stuart Fletcher, CEO, Bupa-- "The Three-Box Solution is an extremely stimulating, encouraging, valuable, and enjoyable read." Brian D. Goldner, Chairman, President, and CEO, Hasbro, Inc.-- "In The Three-Box Solution, Govindarajan concisely and bravely distills key insights applicable across varied industries and provides practical takeaways to facilitate execution. The book is a must-read for any manager who values courageous leadership, adaptability, and foresight." Cyrus Mistry, Chairman, Tata Group-- "Govindarajan offers unique insights into the need to balance the demands of the present with those of the future. He highlights the importance of investing wisely in building the future while creating a sense of urgency about embracing change. Many managers will relate to the caution he urges about getting too caught up in the all-consuming demands of the present. For a more-than-century-old organization like Tata, his three-box framework offers many important lessons." Narayana Murthy, cofounder, Infosys Limited-- "In today's world, organizations need to continuously innovate and demonstrate a high degree of learnability to stay relevant and ahead of the competition. Through real-life cases and simple frameworks, Govindarajan provides insight and guidance on how leaders can prime organizations for the future while balancing priorities of the present. The Three-Box Solution is a must-read for leaders at all levels." Abidali Z. Neemuchwala, CEO, Wipro Limited-- "The three-box approach is a pragmatic way to think through and balance the needs of existing business and crafting a future. Explained in a simple manner, it provides a framework that leaders can use to reflect on the dynamics of business and attain present and future goals. In today's business environment, leaders are required to run both a sprint and a marathon at the same time." Doug Oberhelman, Chairman and CEO, Caterpillar Inc.-- "The Three-Box Solution offers a sound, strategic approach to ensure that Caterpillar's long history of innovation--developing, designing, and manufacturing the machines and engines our customers want and need--continues." Vijay Govindarajan (known as VG) is the Coxe Distinguished Professor at Dartmouth's Tuck School of Business, a Marvin Bower Fellow at Harvard Business School, and widely regarded as one of the world's leading experts on strategy and innovation. He is the author of many books and articles, including the New York Times bestseller Reverse Innovation.